The popular molecular dynamics suite NAMD goes quantum! The developers of NAMD and the developers of ORCA at the Max Planck Institute for Chemical Energy Conversion as well as at FAccTs, have joint efforts to create an integrated, comprehensive, customizable and easy-to-use suite for QM/MM and Molecular Dynamics calculations. NAMDs graphical user interface VMD provides extended setup, visualization and analysis tools. 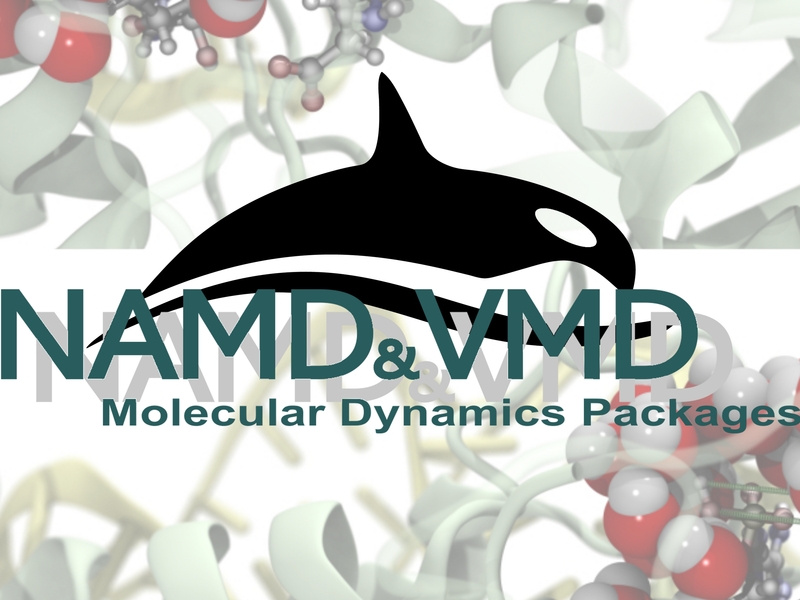 NAMD is one of the most widely used molecular dynamics suites, with a strong user base in the biophysics community. Developed as Not Another Molecular Dynamics program in 1995, it is now one of the Nanoscale Molecular Dynamics programs in use. Written using Charm++ parallel objects, it excels in speed and efficiency, making it particularly suitable for calculations on very large systems as they occur e.g. in biology. As most molecular dynamic packages, NAMD has so far used molecular mechanics force fields to describe interactions. Even though these force fields are derived from quantum-mechanical calculations, they are not equivalent to a quantum-mechanical description of the system. Crucial processes such as chemical reactions as well as important properties such as charge distributions can only be correctly described and captured through a full quantum-chemical calculation. Quantum mechanics, as accurate and complete as it is, is computationally demanding and costly when it comes to time evolution of large systems. Even with the advanced hardware technology available today, nanosecond time evolution of systems of practical interest, such as large biomolecular systems and solid-state systems or systems in solution, is already prohibitive. The solution to this dilemma is a division of the full system into one or more sub-regions in which the important chemistry is suspected to take place and into the larger surroundings. The sub-regions are treated on the quantum-mechanical level, whereas the surroundings are treated on the classical, molecular mechanical level. This hybrid method has, for obvious reasons, been dubbed QM/MM and combines the best of both worlds: the accuracy of quantum mechanics with the speed of molecular mechanics. 1 For semi-empirical calculations, a native interface with the program package MOPAC has been implemented. 2 Scientific Background on the Nobel Prize in Chemistry 2013: DEVELOPMENT OF MULTISCALE MODELS FOR COMPLEX CHEMICAL SYSTEMS, The Royal Swedish Academy of Science, page 8. M. C. R. Melo, R. C. Bernardi, T. Rudack, M. Scheurer, C. Riplinger, J. C. Phillis, J. D. C. Maia, G. B. Rocha, J. V. Ribeiro, J. E. Stone, F. Neese, K. Schulten, Z. Luthey-Schulten, "NAMD goes quantum: an integrative suite for hybrid simulations", in: Nature Methods 4638 (2018).